I’ve been experimenting with donuts lately. I have honestly had the best success with store-bought refrigerated biscuits. Trust me on this!! The refrigerated biscuits deliver a soft, thick donut…perfect for filling. Because you’re using already made biscuits…half the work is done. 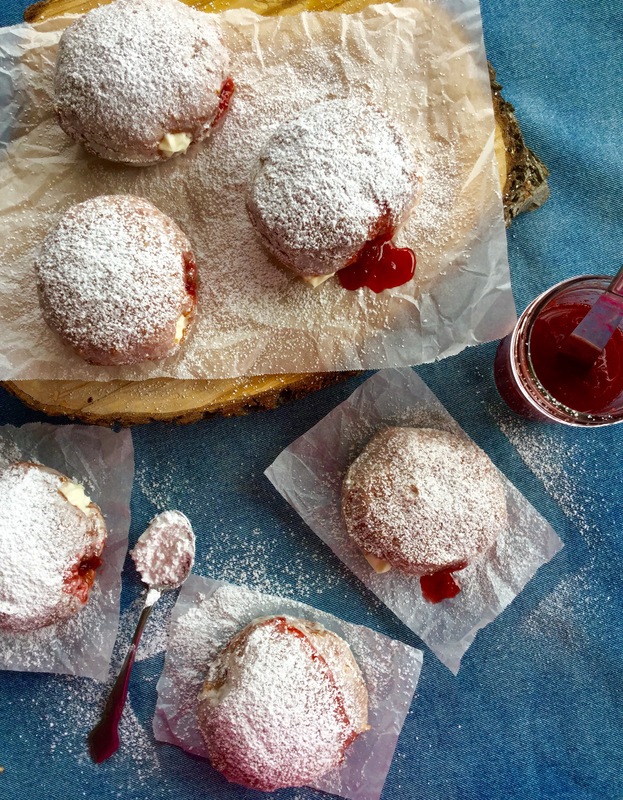 Just fill them full of homemade strawberry jam and creamy cheesecake filling. My family went crazy over these!! My Aunt even asked for a batch to enjoy on her vacation to the mountains. No one even knew I used store-bought biscuits. 1)Have the glaze prepared and close by, so that when the donuts are finished frying you can drop them immediately into the glaze. Also have two cooling racks ready with parchment paper underneath them for the glazed donuts to cool on. 2)I highly recommend having a thermometer to help keep an eye on the oil temperature. You want the oil to stay around 350 degrees F.
3)I use a 8.5 quart dutch oven to fry my donuts. I can fry four at a time, but if you don’t have a dutch oven that big, or if you don’t have a dutch oven at all, you can just use a heavy bottom pot. Don’t crowd the pot, just a few at a time. 4)I’ve found that the best way to know that the donuts are completely cooked through is when the donuts puff up, the tops will dome, and the outside will be a deep golden brown. Start by preparing the glaze: in a large mixing bowl, add in all the glaze ingredients. Using a handheld mixer, beat everything together. Set close by so that once the donuts come out of the oil they can be glazed. Next begin frying the donuts: heat one quart of oil in a dutch oven to 350 degrees F, using a thermometer. Remove the refrigerated biscuits from their packages. Once the oil is up to temperature, gently drop biscuits into the hot oil ( be very careful ). Fry 2-4 biscuits at a time. Donuts are done when the biscuits puff up and are a deep golden brown. Remove the donuts from the oil and drop immediately into the glaze. Once the donuts are covered with glaze place on a wire rack with parchment underneath. Continue until all the biscuits are fried. Let the donuts cool completely. Once the donuts are completely cooled, use the end of a wooden spoon to make two holes into the side of each donut; set aside. Make the filling: cream together the cream cheese and powdered sugar until smooth, add in the heavy cream and vanilla, beat together. Place filling in a piping bag fitted with a tip. Fill one of the holes with the cheesecake filling and fill the other hole with about 1 Tablespoon of the homemade strawberry jam. I use a butter knife to drop the jam into the hole, I sometimes repoke the hole for the jam….just to make sure none of the cheesecake filling is in the way. 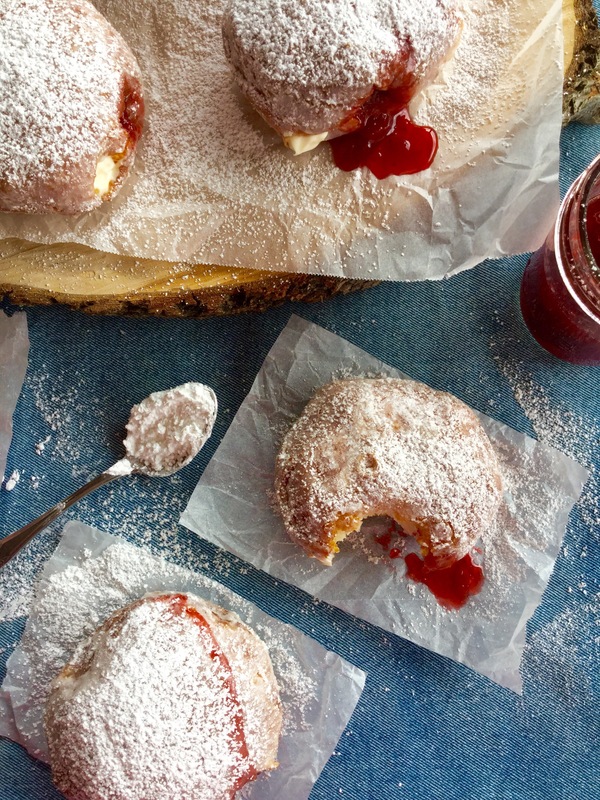 Finally, lightly dust each donut with powdered sugar. Enjoy!